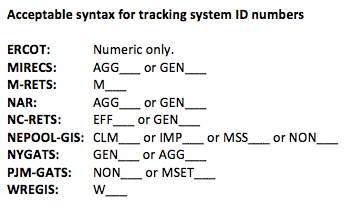 This Green-e® Energy Tracking Attestation Form is required for generating facilities registered with a renewable energy tracking system in the United States or Canada (ERCOT, M-RETS, MIRECS, NARR, NEPOOL-GIS, NC-RETS, PJM-GATS and WREGIS), that either (a) wish to be identified (including within that tracking system) as producing renewable energy that may be used in a Green-e® Energy Certified product or (b) whose renewable energy is claimed to be within the supply chain of a product that is subject to an annual sales and supply audit for Green-e® Energy certification. Green-e® Energy is a voluntary program that certifies renewable energy products meeting criteria developed by the nonprofit Center for Resource Solutions (CRS). Acceptance by CRS of a completed Tracking Attestation indicates that the facility identified in the attestation meets the eligibility criteria of the Green-e Energy Standard for the United States and Canada. This does not mean that the facility, facility owner, facility’s output, or sale of facility’s output is Green‑e Energy Certified. It simply means that the facility’s output may be used by certain renewable energy sellers to more easily make sales of Green-e Energy Certified products. Only sellers that maintain certification contracts with CRS are able to make such sales. If the Tracking Attestation is accepted by CRS, basic facility information will appear on the Green‑e Energy website so potential buyers may consider purchasing your renewable energy for their Green‑e Energy Certified products. Sales to participants in the Green-e Energy certification program will be subject to review as part of the Green‑e Energy verification process. The maximum period covered by this form is three years, although the owner of the generating facility or the entity to which facility registration rights have been assigned may indicate a more limited period in the attestation form. In addition, the Tracking Attestation will remain in effect only so long as the facility: (a) is actively registered in a tracking system, (b) remains in compliance with all of that tracking system’s rules, and (c) the facility’s output is used in Green‑e Energy Certified products. If facility information or characteristics change, Green‑e Energy requires submission of an updated attestation. The party completing and signing the attestation must notify Green‑e Energy staff immediately in writing if any of the following occurs: the facility ceases to be registered in the tracking system for any reason, violates tracking system rules, or is ineligible under the most current version of the Green-e Energy Standard for the United States and Canada. This attestation is not a contract to make Green-e Energy Certified sales. CRS reserves the right to remove the Green‑e® Energy eligibility designation from a facility at any time at its sole discretion. At this time, there are no fees due to Green‑e Energy or CRS associated with the signing this form. Please read through and complete this attestation form and submit it to Green‑e Energy. Green‑e Energy reserves the right to reject the attestation if any field or box is not filled in correctly. For more information about Green‑e Energy, please visit www.green-e.org. If you have any questions, please contact Green‑e energy staff at 415-561-2100 or email forms@green-e.org. Wherever used in this Attestation and whether or not accompanied by a ® or other symbol reflecting ownership interests, "Green-e" means the mark, whether registered or not, containing the word Green-e, to which CRS asserts ownership rights. Copyright Center for Resource Solutions. All rights reserved. EIA or QF. The EIA number is the facility's unique plant code listed on the EIA-860 2__Plant form here: https://www.eia.gov/electricity/data/eia860/. If the facility has both an EIA and QF number, list the EIA. Would you like contact information to be shared on the list of facilities with approved tracking attestations? If yes, sellers in the Green-e Energy program may contact you about purchasing generation from this facility. Are you selling to a Green-e certified Participant? Owner Account Manager If the Facility has been registered in Tracking System by an entity other than Owner, for the purposes of this form that entity will be the "Account Manager" and this form must be completed by an authorized agent of the Account Manager. If there is no Account Manager, and Owner manages Facility’s account, Owner must complete this attestation. If Generator Owner is a corporation, partnership or other legal entity, this Consent must be executed by a company officer of the Generator Owner. If Generator Owner is an individual, this Consent must be executed by the individual. This form governs generation at Facility beginning on this date (default is January 1 in the year of signature). Date this form expires. Default is December 31 of the second year after Start Date. For example, if the Start Date is May 1, 2010, the Expiration Date is December 31, 2012. The Tracking Attestation Expiration Date cannot be more than 14 years from the date facility was first operational. If this date is earlier than the Tracking Attestation Expiration Date, this date becomes Expiration Date, and this Tracking Attestation form will expire on this new Expiration Date. Please attach PDF. Many tracking systems have specific forms for designating a party other than the facility owner as having the right to register the facility in the tracking system. In some cases, contracts between Owner and Account Manager are acceptable to the Tracking System, in which case pertinent sections of such a contract may be submitted along with the contract's signature page. Account Manager has attached docs Account Manager has attached documentation accepted by Tracking System and signed by both Owner and Account Manager authorizing Account Manager to register Facility in Tracking System. (Account Manager must attach form and check box) Many tracking systems have specific forms for designating a party other than the facility owner as having the right to register the facility in the tracking system. In some cases contracts between Owner and Account Manager are acceptable to the Tracking System, in which case pertinent sections of such a contract may be submitted along with the contract’s signature page(s). Statements on this form apply to all generation occurring between Start Date and Expiration Date (“Effective Period”) unless during the Effective Period the Facility owner is reporting its direct greenhouse gas emissions in a legally binding cap and trade program, or Facility is located in an area participating in a greenhouse gas cap-and-trade program that affects the electricity sector (entered in cap-and-trade section below). If none of the generation from Facility that occurs between Start Date and the following June is used in a Green-e Energy certified product, Facility’s designation as “Green-e Energy Eligible” in the Tracking System and on the Green-e website will be removed. If this happens, Facility may reapply and must demonstrate that it is selling its output to a Green-e Energy program participant in order for the application to be considered for approval. Is Facility approved as “Repowered” by Green-e Energy? Is Facility co-firing eligible fuel(s) under the Green-e Renewable Energy Standard for Canada and the United States with non-eligible fuel(s)? Please select... Yes No Green-e Renewable Energy Standard for Canada and the United States Choose YES if Facility is eligible under the Green-e Renewable Energy Standard for co-firing because either the Facility’s co-firing methodology has been approved by Green-e Energy (attach approval from Green-e Energy); or Eligible fuels are in liquid form and their use is separately metered from ineligible fuel use; or Facility is registered in a Tracking System that separately tracks MWh derived from eligible fuels from MWh derived from ineligible fuels. Please select... Less than 5% BTU non-RE Facility’s co-firing methodology has been approved by Green-e Energy (attach approval from Green-e Energy) Eligible fuels are in liquid form and their use is separately metered from ineligible fuel use Facility is registered in a Tracking System that separately tracks MWh derived from eligible fuels from MWh derived from ineligible fuels. During the Effective Period is Facility owner reporting its direct greenhouse gas emissions in a legally binding cap and trade program, or is Facility located in an area participating in a greenhouse gas cap-and-trade program that affects the electricity sector? Reporting Direct Greenhouse Gas Emissions in Cap and Trade? Please select... Yes No If "Yes," the renewable energy or renewable energy certificates reported on this form may be ineligible for Green-e Energy certification. For more information, contact Green-e Energy Staff at 415-561-2100 or info@green-e.org. During the Effective Period is Facility receiving carbon offsets or other carbon credits for any of its activities, even if not related to renewable electricity generation (e.g. offsets from landfill gas flaring at a landfill site)? Please list the offset program and protocol, including the version number. If the Electricity Purchaser is not in the list, specify here. Is sale part of a Qualifying Facility (QF) contract? Please select... Yes No If the electricity is being delivered without the associated REC, then this electricity is “null power” and the electricity purchaser is not purchasing renewable electricity. If Facility is located in Canada and the Renewable Resource Type is hydropower, then Facility is EcoLogo certified throughout Effective Period; if Facility loses EcoLogo certification for any reason I will notify CRS immediately. I attest to one of the following below (check either A or B). A. I attest that no more than five percent (5%) fossil fuels and other fuels that are not Green-e Energy eligible, measured on a BTU basis, were or will be used, including as a start-up, pilot or supplemental fuel, to produce the electricity and/or RECs in the above Green-e Energy eligible biomass generation plant or biomass boiler; B. I attest that Facility is registered in Tracking System as a multi-fuel facility and abides by all multi-fuel provisions in Tracking System’s operating rules. Please list biomass fuel type and name of fuel producer or source of fuel. As an authorized agent of Owner or Account Manager, Signatory declares that they have the knowledge and authority to attest that the statements on this form are true and correct. By signing this form, Signatory is attesting that the statements and declarations herein will remain true for Effective Period. If any conditions change related to the information on this form prior to Expiration Date, Signatory agrees to inform the Center for Resource Solutions in writing as far in advance of the change as commercially practicable. The Signatory understands that submitting this form does not make the facility “certified,” “certifiable,” or “Green-e approved,” nor are any of the RECs generated from that facility guaranteed to be certified. Further eligibility criteria and program requirements will be assessed during the annual verification audit. This includes chain-of-custody tracking, double claims evaluations, and assurance that all supply meets the requirements of the Green-e Renewable Energy Standard for Canada and the United States. Signatory acknowledges Center for Resource Solutions' right to revoke the Tracking Attestation at any time if another the renewable attributes are being claimed by another facility. (Double claims cannot be made). This form is used by Center for Resource Solutions to verify the accuracy of claims made by retail and wholesale marketers of renewable energy. Center for Resource Solutions reserves the right to make information on this form public. Such information may be needed to identify facilities that meet the eligibility requirements in the Green-e Renewable Energy Standard for Canada and the United States.